Wanting to make something from my Mexican culture for Easter, I looked for a recipe for polvorones, which is one of my favorite Mexican cookies. As I searched for a perfect recipe, I came upon one from the Pillsbury site that called for their refrigerated cookie dough. I should have known better, but was tempted by the recipe because it said “very easy”. 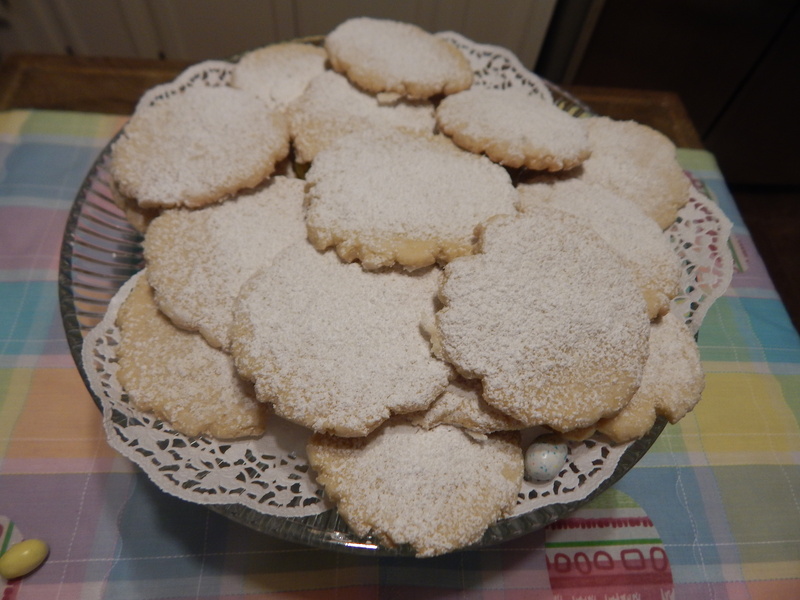 Yes, this recipe was so easy and the cookies came out very pretty, but they don’t taste like polvorones. I gave the taste a rating of 2.5 , only because they taste like sugar cookies, not like polvorones. I gave the appearance of the cookie itself, a 4 out of 5, because they do look very pretty. Learning that easy is not always better, I will keep looking for for an authentic recipe. If you are interested in making a very easy cookie that looks pretty, here is the recipe. 1/2 cup powdered sugar or 2 tbsp colored sugar. Shape dough by rounded tbsp. into balls; roll balls in powdered sugar. On ungreased cookie sheet, place balls 2 inches apart. Press bottom of drinking glass on each ball until about 1/4 inch thick. Bake 9-11 minutes or until light golden brown. Immediately sprinkle with powdered sugar or colored sugar if you prefer. Cool 1 minute then remove from cookie sheet to cooling rack.